On Thursday, November 3, CPT’s Mark Spivak attended the Institute for Continuing Legal Education (ICLE) seminar on Animal Law held at the State Bar of Georgia building in Atlanta. The seminar featured multiple speakers and materials relevant to Mark’s respected work as an expert witness in civil and criminal cases containing issues related to animal training or behavior. Claudine Wilkins, JD, of Animal Law Source, who spoke about dog bite liability, the Responsible Dog Owners Act, and pertinent civil and criminal case studies. Adam Karp, JD, a nationally known animal law attorney from Bellingham, WA. Adam lectured for several hours on a variety of leading edge topics, including civil Section 1983 cases as a strategy for citizens to recover damages when law enforcement officers inappropriately injure or kill a citizen’s dog, the methodology of forensic reconstructions in animal cruelty and dog bite cases, animal custody disputes, forfeiture laws, replevin of a pet improperly or illegally acquired by a third party, federal and state assistance animal access laws, rules of evidence in animal law cases, professional responsibility, veterinary malpractice, and the private initiation of prosecution for animal-related misdemeanors or felonies. Robert Monyak, JD, of Peters & Monyak, and Elizabeth Monyak, JD, of the Office of the Attorney General, who eloquently co-presented about their trial and appellate court experiences recovering financial damages after a family pet died as a result of negligent care at a boarding facility. The Monyaks discussed the issues of actual value, market value, pertinent expenses, ordinary negligence, gross negligence, outrage/emotional distress, punitive damages, pertinent statutory and case law in a variety of states, and changing laws and practices that now often consider pets as sentient beings that have an emotional connection to their owners, rather than mere inorganic chattel. Tara Stoinski, PhD, President and Chief Scientific Officer of the Dian Fossey Gorilla Fund International, who discussed the people, gorillas, climate, and topography of central Africa and conservation efforts to combat poaching and the elimination of gorilla habitats. 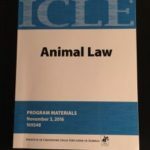 The audience was comprised principally of attorneys that specialize in animal law or who were interested in expanding their practices to include animal law. However, there were also 2 veterinarians and Mark, who was the lone expert in animal behavior. Mark found the seminar an excellent vehicle for networking and for keeping current on the changes germane to animal law. Increased prowess and knowledge regarding statutory law, case precedent, and case strategies will enable Mark to provide greater value to a legal team that contracts his services. Moreover, Mark enjoys the quest for justice inherent to expert work and wishes to further expand his work load, which in the past two years has included cases in Georgia, Florida, North Carolina, Pennsylvania, and Montana.